A Teaspoon and A Pinch: Have You Found Your Dish Yet? 1. Taking Hot Chocolate and a tin of popcorn along with us to see the Christmas Lights and Snow Globes. 2. Putting up our tree on Thanksgiving Day. 3. Opening PJ's and stockings on Christmas Eve. 4. Counting down the days of Christmas with simple presents. 5. Annual shopping date with Hubby sans children. We shop, chat and eat somewhere fabulous. But no tradition is as important as the food. My childhood memories are all about being around family. Year after year we would all gather at my Grandma's house. While I can remember lots of funny things that happened...the thing that brings those memories to life is the food that everyone would bring. They all seemed to have signature dishes that we all looked forward to enjoying. I think with every recipe I try...Could this be the one that I save to make year after year? Will my children tell their children you have to try Grandma Rock's (insert fabulous dish here). This year I'm trying my hand at peanut butter balls, while they didn't turn out fabulous, I think with a few adjustments they could be. Cream together the butter, vanilla, salt and peanut butter. Stir in 2 cups of the confectioners' sugar, nuts and all but 1/2 cup of the graham cracker crumbs. Add the last 1/2 cup of graham cracker crumbs only if needed; otherwise it may be difficult to mold the balls. Form the mixture by hand into 1 inch balls. Roll each ball in the remaining cup of confectioners' sugar. Set the balls in a single layer on a cookie sheet and refrigerate until firm. At this point the cookies may be dipped in melted chocolate or they can be left plain. Store in an airtight container in the refrigerator. To Dip Balls In Chocolate: In the top half of a double boiler; melt the chocolate chips and shortening just until the chips are melted. Remove from heat but leave over hot water. 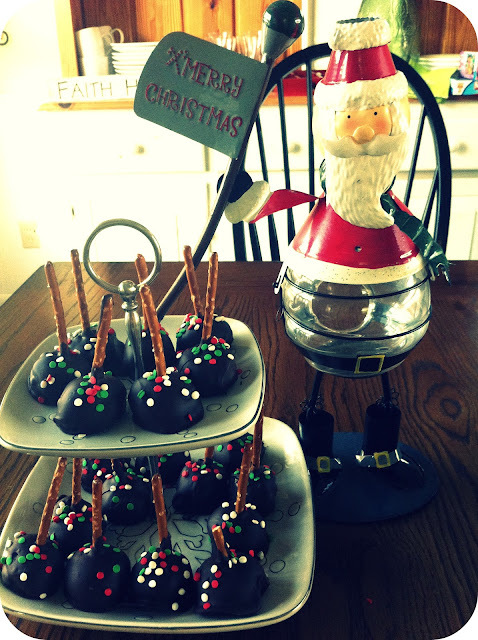 Insert a toothpick into the chilled balls and dip into the melted chocolate until coated. Set on waxed paper until hardened. I didn't use graham crackers and am rethinking the semi-sweet chocolate chips. I think they would have been much better with a milk chocolate instead. What about you? Have you found a recipe that with time could be one you are famous for in your family? We already have a recipe that has been around for years, two actually. Both were created by my great-grandmother. Granny T's Sugar cookies (light, super-soft, and hard to keep around) and Granny T's Snickerdoodles (a variation on the sugar cookies and oh-so-good!) I've tinkered with the sugar cookies recipe a little and have made minor changes to the amounts. I like to add some buttercream frosting (Wilton recipe) and they just melt in your mouth. The onlt problem I've found with these cookies is that they don't ship well when frosted. I just toss in a couple of disposable bags of the frosting into the package and people go nuts!